This walk: 2015-9-9. Plaster / Plaister Down, Sampford Spiney parish boundary stones, Devil's coach horse, Sharpitor, North Hessary Tor, Sampford Tor, Heckwood Quarry, Vixen Tor, Saddle Rock, Cloven Saddle Rock, Windy Post, Pew Tor. Plaster / PlaisterDown car park (almost) and any colour car you want - as long as it is silver (almost)! World War II bomb crater. Devil's coach horse (different link). North Hessary Tor tv transmitter station. Pewtor Cottage (other names for Pew Tor are Pu Tor and Putor). Is this marked by the feather and tare method or by the wedge and groove method? Another view of the cut cleft. I have seen better sunbeds! Google Earth image of the granite blocks along the seaward side of Plymouth Breakwater! Edit - I have been corrected regarding these blocks: sometime in the mid/late-1960s, students were employed, presumably by the Ministry of Public Building and Works, to clean the huge metal moulds that these massive concrete sea defence blocks were made in. See the "W" signifying Whitchurch on the other side? Second attempt at the group photo - you have to click on the photo to see the naughty first photograph! Windy Post, on the skyline. "SB" on the western face. Double parish boundary stones, the old one (left) was broken and replaced with the one on the right, at SX 53760 74734. Bullseye stone that governs the takeoff of water into a side leat going towards Oakley Farm etc. One of the 1847 mason's marks around Pew Tor beyond which it was forbidden to take stone: more information in the 28th December 2011 walk. Full details of the Sampford Spiney parish boundary stones can be found in Dave Brewer (2002), Dartmoor Boundary Markers, Halsgrove, pages 166-173. 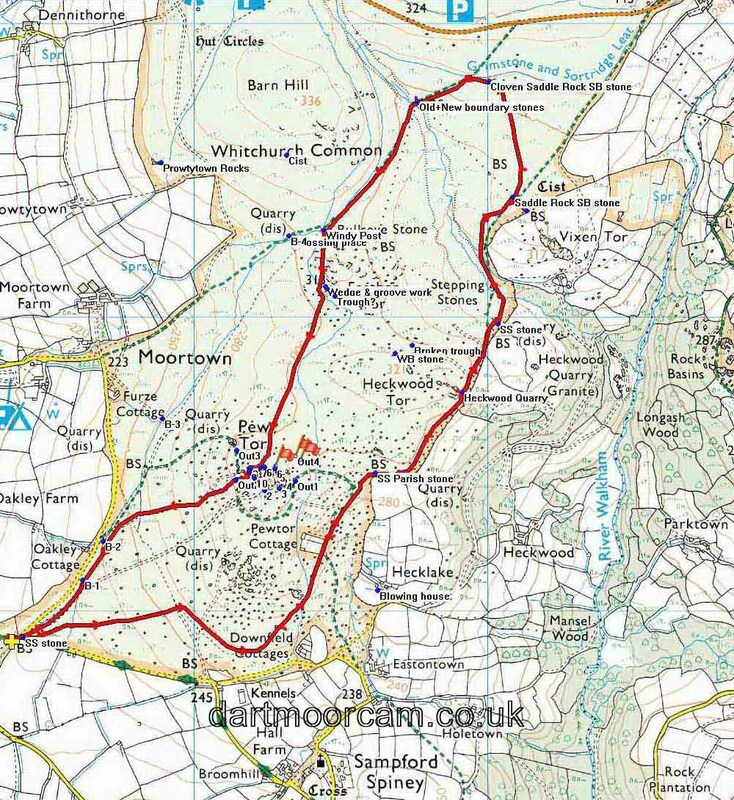 This walk was reached by driving from Whitchurch, out past the Whitchurch Inn, across the golf course, follow signs to Princetown, then Moortown, parking on the grass just after turning left for Moortown - marked by thre yellow cross on the map (at SX 52377 72896). Distance - 6.62 km / 4.11 miles.